Microsoft frequently releases updates to patch security vulnerabilities and improve features and stability. However, from time to time, certain updates can mess with your system and cause instability. This is especially true for automatic driver updates on systems with older graphics cards, like the switchable laptop graphics card. In those situations, you can pause Windows 10 updates. If you think that is too much, you can also temporarily hide the updates. When you hide an update, Windows 10 will no longer download and install it. 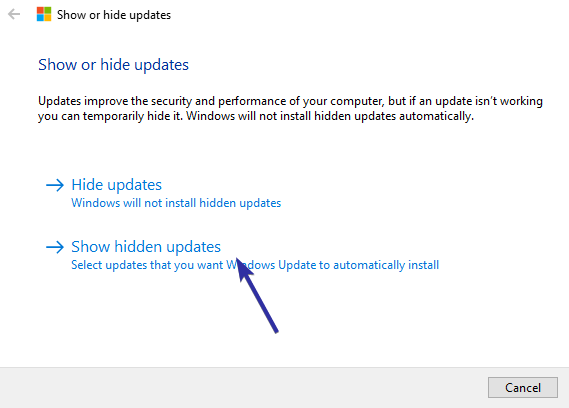 Here's how to hide updates in Windows 10. Note: Hiding updates is just a temporary solution. 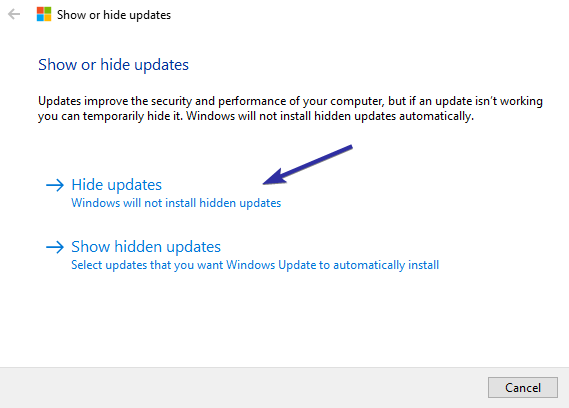 After some time, usually after 30+ days, Windows 10 will automatically unhide the update and installs it, if needed. Microsoft actually created a simple GUI tool called Show and Hide updates. Using this tool, you can hide any update you want with just a few clicks. 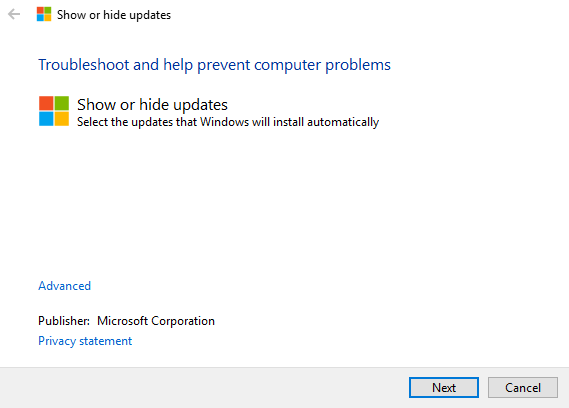 Though the tool is mainly intended to hide driver updates, you can also use it hide other Windows 10 updates too. 1. First, download the Show and Hide Update tool. Once downloaded, double-click on the file. Being a portable application, you don't have to install it. 2. In the main window, click on the "Next" button to continue. 3. Since we want to hide the updates, click on the "Hide Updates" option. 4. The application will now scan your system and lists all the available updates. Select the checkbox next to the update you want to hide and click on the "Next" button. 5. The application will now hide the selected update automatically. Once hidden, you will see the "fixed" message in the next screen. Click on the "Close" button and you are done. In the future, if you want to unhide the hidden update, follow the below steps. 1. Open the Show and Hide updates tool, click on the "Next" button and then click on the "Show Hidden Updates" option. 2. The application will scan the system and shows all the hidden Windows updates. To unhide an update, select the checkbox next to it and click on the "Next" button. 3. As soon as you click on the button, the update will be unhidden. Once the update is unhidden, Windows 10 will automatically download the update as and when needed. If you are a PowerShell guy, you can use the PowerShell commands to quickly hide or unhide Windows 10 updates. Though the process is easy, to use the PowerShell command, you need to download and import a Windows Update module. 1. 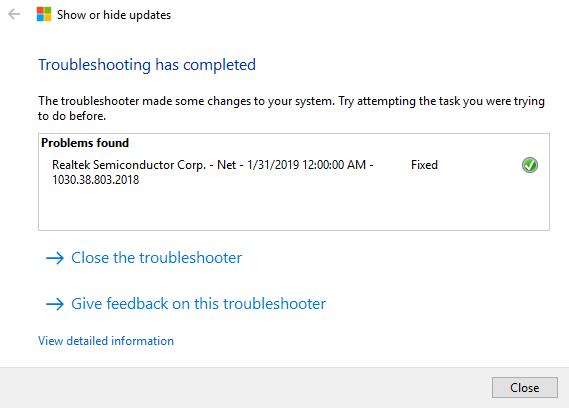 Go to the Microsoft Technet page and download the PSWindowsUpdate module. Once downloaded, open the zip file. 2. Copy the PSWindowsUpdate folder in the zip file and paste it in the following location. You might see an "access denied" prompt. Click on the "Continue" button. 3. Now, search for PowerShell in the command prompt, right-click on it and select "Run as administrator". This action will open PowerShell with admin rights. 4. By default, PowerShell uses Restricted execution policy which blocks script execution. Since we want to execute a script, change the PowerShell execution policy from Restricted to RemoteSigned. 3. Though we've added the PSWindowsUpdate module in the PowerShell Modules folder. We need to formally import it. To do that, execute the below command. If the module is imported successfully, you will not see any output. 4. Before you can hide an update using PowerShell, you need to know its name or KB number. So, use the below command to list all the available updates for your system. The command can take a few seconds to return the results. 5. To hide an update using the KB number, highlight the KB number of the update you want to hide using the mouse and right-click inside the PowerShell window to copy the number. 6. Next, use the command below to hide the target update. Replace KB_Number with the actual KB number. 7. You will be prompted to confirm your action. Type A and press Enter. If the update is successfully hidden, you will see "H" under the update status. 8. If there is not KB number available for an update, like a driver update, you can use the update title. To do that, first, get a list of all the updates using the Get-WUList cmdlet. Next, copy the update title from the PowerShell window. Just a part of the update title is enough. Just make sure that it is unique from other update titles. For instance, I'm copying "Realtek Semiconductor". In the list, there is no other update with those words. 9. Next, use the below command to hide the update. Don't forget to replace "UpdateTitle" with the actual update title. 10. You will be asked to confirm the action. Type A and press Enter to confirm the change. Once the update is hidden, you will see "H" under the update status. 11. To unhide an update, use one of the below two commands. That is all. 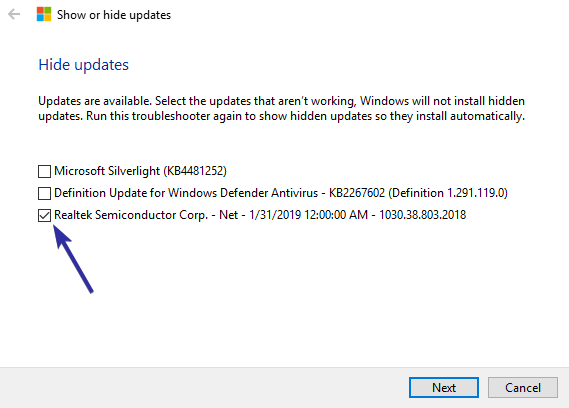 It is that simple to hide updates in Windows 10 using PowerShell or a first-party tool. 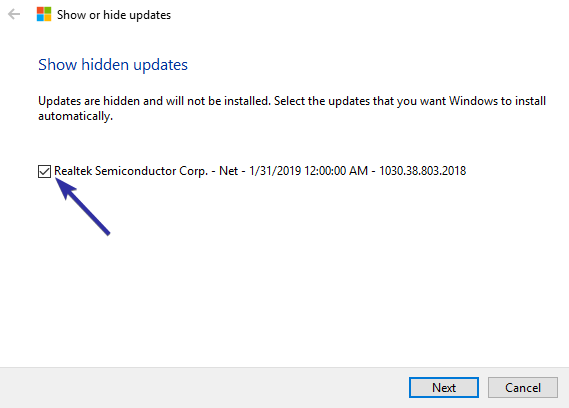 If you like this article, do check out how to check Windows updates size and how to change a network location from public to private in Windows 10.